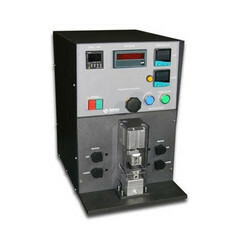 Our product range includes a wide range of electronic box compression tester, box compression tester, puncture resistance tester, concora medium flutter, peel seal strength tester and drop tester manual. 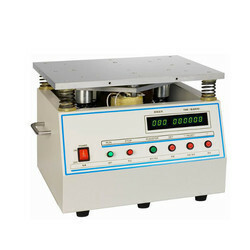 Electronic Box Compression Tester is used to determine the compression strength of corrugated & non-corrugated boxes. 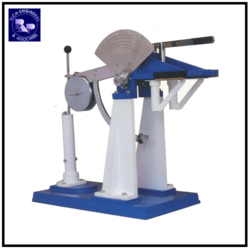 The instrument is provided with Digital display of compressive load for determination of box compression strength. Instrumenty is supplied with memory for retaining peak value,automatic or normal zero setting, motorized version with AC drive and AC geared motor. It provides variable compressive speed ,overload and over travel protection facilities. As per TAPPIT-804, DIN EN 22872. Packaging Details: (A)	Packing & Forwarding Charges @ 3% (B)	Insurance & Freight to be covered by the buyer. (C)	GST : 28% HSN Code (8419) We will go for an Annual Maintenance Contract on basis of service charges after sales. 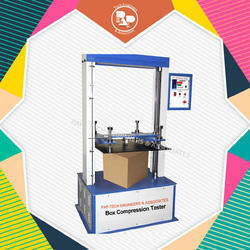 Box Compression Tester is used to determine the compression strength of corrugated & non-corrugated boxes. The instrument is provided with Micro controller display of compressive load for determination of box compression strength. Complete with memory for retaining peak value,automatic or normal zero setting,motorized version with AC drive and AC geared motor. It provides variable compressive speed,overload and over travel protection facilities. It can be attached with computer & printer. 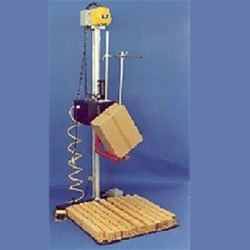 This Instrument is used to determine the compression strength of corrugated box. Our Microprocessor based model is the most advance model in Packaging Industry. Packaging Details: (A)	Packing & Forwarding Charges @ 3% (B)	Insurance & Freight to be covered by the buyer. (C)	GST : 18% We will go for an Annual Maintenance Contract on basis of service charges after sales. Being a client focused organization, we are offering high grade Puncture Resistance Tester. The resistance tester offered by us is used to determine the energy required to pierce a clamped sample. This instrument measures puncture resistance of various packing materials and gives reliable indication to evaluate fabrication factors with material values in a composition fashion. The puncture resistance of paperboards is measured as the energy required to force a puncture head of specific design through a test piece of board under specified condition. Rigidity of the fluted structure is one of the essential characteristics of corrugated board and this test is necessary to identify and measure the crushing resistance of the fluter structure on the corrugators and other converting equipment. It is most essential to make laboratory specimen of fluted strip of corrugating medium for conducting Concora Medium Test (CMT). Load Cell Range 0 - 500 gm. est Speed 100 mm/min. 254 mm/min. 300 mm/min. It is used to check and evaluate the interfacial adhesion properties of flexible packaging material by retaining peak values,automatic or normal zero setting, overload and over travel protection facilities. control) and R&amp;D (research &amp; development) test routines. containers. Catering for the following types of drops e.g. flat corner &amp; side. accurate test results with high repeatability. A precise and reliable machine. Precisely machined to International Standards. ¿¿¿ Facility for corner droops. We specialized in offering a premium quality range of Scuff Tester. Offered Scuff Tester is developed employing quality-proven material and high-end technology in conformation with current market standards. Our scuff tester is used to measure or evaluate color transfer from printed / coated surface during rubbing. Customers can avail the offered scuff tester from us in various specifications in a given time frame. 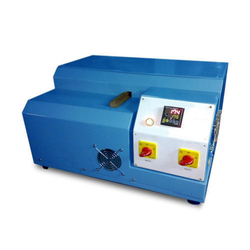 Scuff tester is used to evaluate the Rub Proofness of Prints on Paper or Board.It can also be used to evaluate colour transfer from printed/coated surfaces during rubbing. 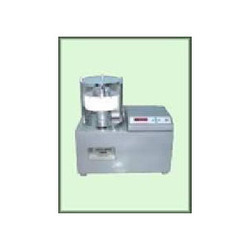 Vibration Tester is designed to test & evaluate the transport worthiness of filled Cartons / Jars /Drums / Containers as per international specifications. 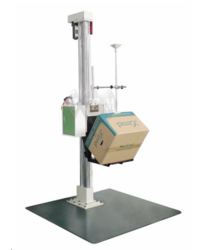 We have gained immense recognition in offering premium quality Pouch Burst Strength Tester. Our offered tester is provided with quality packing in order to ensure its safe transit. 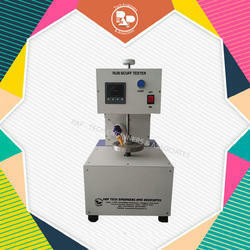 This tester is manufactured from the high quality of material & modern techniques in compliance with the set norms of industry. The offered tester is provided in numerous specifications to choose from in a stipulated time frame. 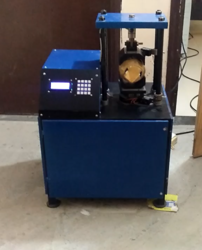 This instrument is used to test integrity/seal strength of liquid/semi-solid filled pouches with or without gas/air such as shampoos/oil/tea/leaves in "Pouches/Watches/Chips" on FFS machine.